Looking for a cheap and easy to use beach volleyball kit for recreational use that's tough enough to stand up to the heat of battle? This is it! The Joust Weekend Warrior portable beach volleyball kit is the lightest, toughest and most user friendly beach volleyball kit we have found for under $200. It has light weight telescoping alloy poles that wont rust or weigh you down on the walk to the sand. They have 3 height adjustments so they suit men's and women's height nets. 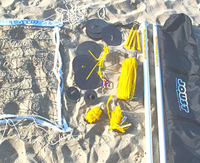 The kit also includes a 9.5m rope top net with repeating logo, guy ropes for the poles and ski rope boundary lines. As an added bonus you also get both grass stakes and a complete sand kit. This means the kit can be used either at the park on grass or at the beach on sand without any extra items needing to be purchased. To top it all off everything comes in a tough carry bag that has enough spare room to easily fit personal items like wallet, keys, sunscreen, etc, etc.